Excuse the dark pictures today – I hope you can still see the detail! 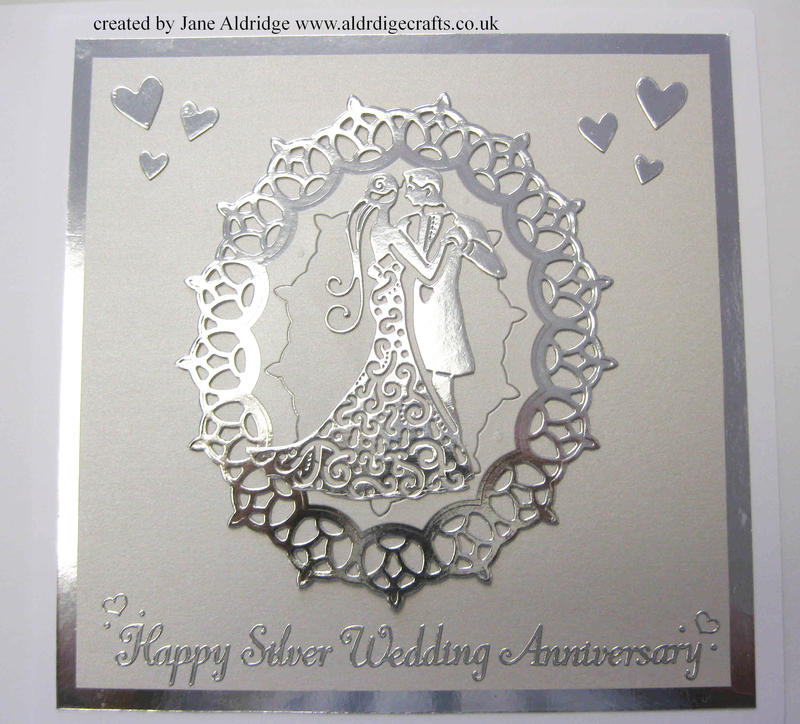 I had a couple of commissions to make a silver wedding anniversary card and a wedding card – so I thought that the Tattered Lace Couple die would make a perfect centre piece. 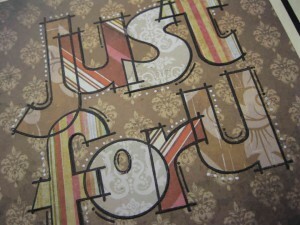 I cut out the die using mirri card and then selected a Tonic layering die that would compliment. 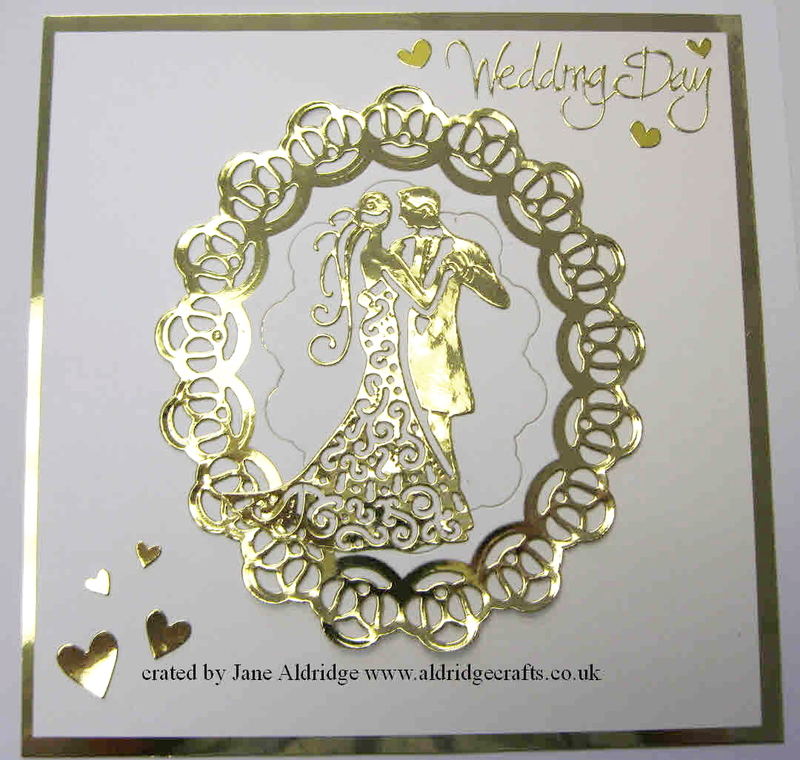 The silver Card uses the Baroque Ovals and the gold card the Loopy Lace Ovals . I then cut the inner oval using the two part die – but stuck them down together – that creates that pretty border in the middle. 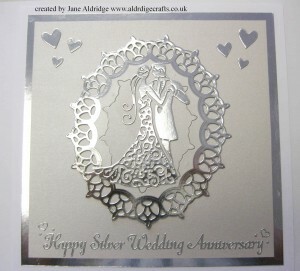 Finally a few hearts cut from Memory Box Beloved Hearts die and some Peel off greetings added the finishing touches. 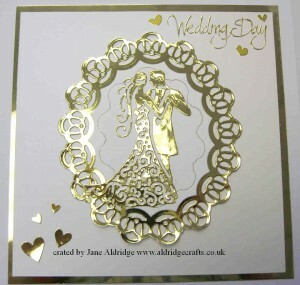 This makes a lovely 8×8″ card for a special occasion. I really enjoyed making these two dies – unusual for me to make something with no stamping at all – I definitely need to play more with my dies. We’ll be at the Suffolk Papercrafting Show in Bury St Edmunds at the end of the month (Sunday 26th June) – Tickets available from Keep on Crafting in Bury St Edmunds. 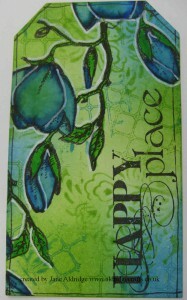 Distress Ink tag again today. Along the same theme as my last post I made this in a recent Chocolate Baroque flower tag workshop. I love the colours of this one! They just blended so well and are vibrant and yet soft. The main colour is Mowed Lawn together with some Salty Ocean. I started by inking the background to get colour blocks to have a base. 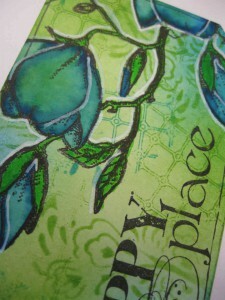 Then I stamped in the same colour inks using the Studded Lattice stamp. I think I also added some leaf detail with one of the patterns from Seasonal Fragments. 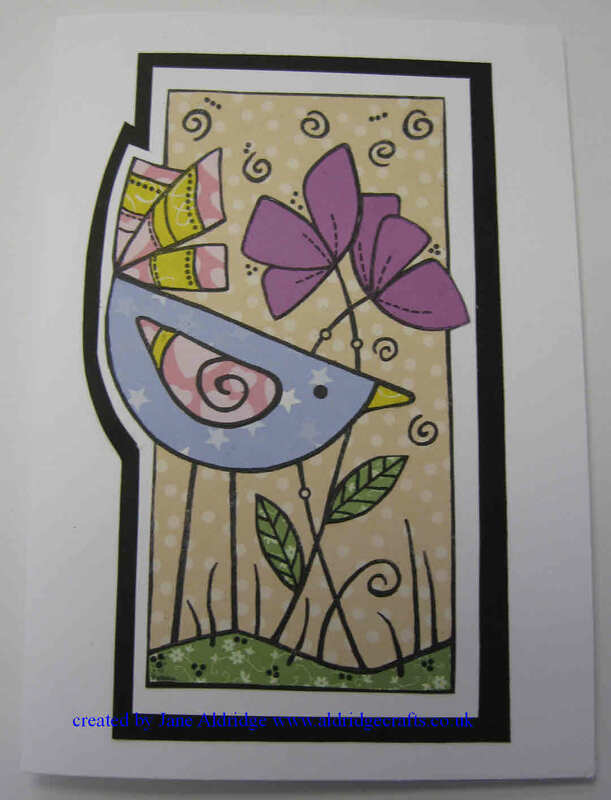 Then the flower is the lovely Magnolia Stamp and the words from Artistic Affirmations. I used the waterbrush to blend the colours on the flower – using mainly blue – but the water activated the green underneath to give a beautiful blend. Once the tag was dry I added some white highlights with the White Sharpie marker. 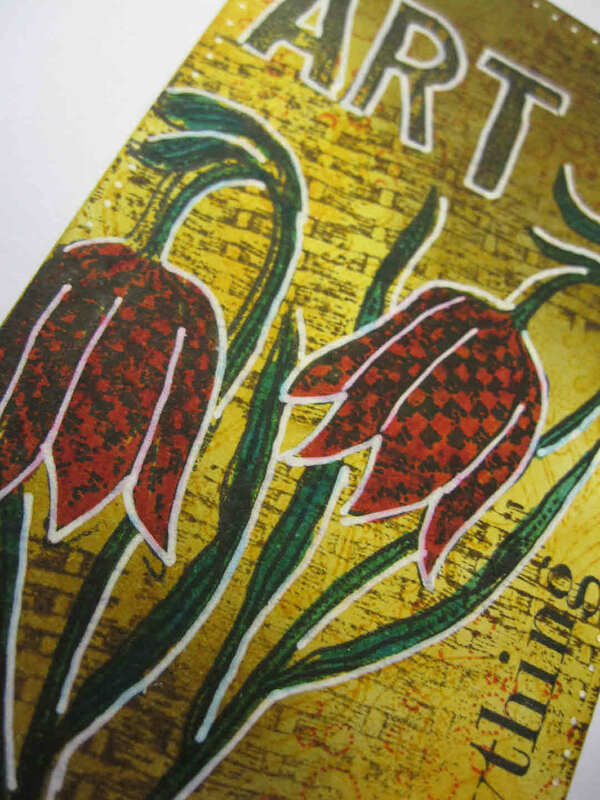 Trickiest bit about this blog post is spelling Fritillary hahaa… even when I checked it it just didn’t look right! I’ve been playing with Distress Inks again – so the tag was inked with ink using blending sponges (I didn’t note the colours – but looks like Fossilised amber and probably Ground espresso with a bit of Mustard seed to brighten it up). The flower stamp is the Chocolate Baroque Fritillary stamp and the words are from the Chocolate Baroque Artistic Affirmations set. You can see that fab brickwork in the background – which is from the Rustic Fragments set – ideal if you like your textured backgrounds! 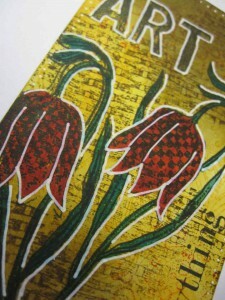 When I first stamped it I thought it looked way too dark – but once I started putting the flower on the top and added the Red colouring it really worked. Final white highlights and dotty border with good ole white sharpie marker and it really gives this tag some drama. Oh an extra note – the wording is all on one stamp – Art with everything – I just inked up the words separate – wiped clean the rest of the stamp (you can also use copy paper to block to make sure you don’t stamp the other words) – and voila you can split your large phrases to fit on a little tag. 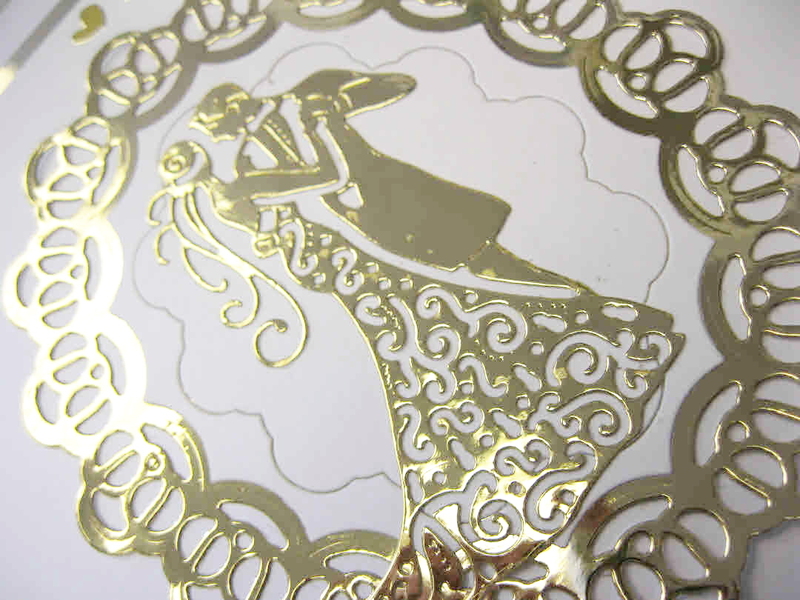 PS – don’t forget Veronica from the Chocolate Baroque Design Team will be demonstrating in the shop on Saturday 18th June 10-3pm – come and be inspired! Back with the paper piecing technique again today. 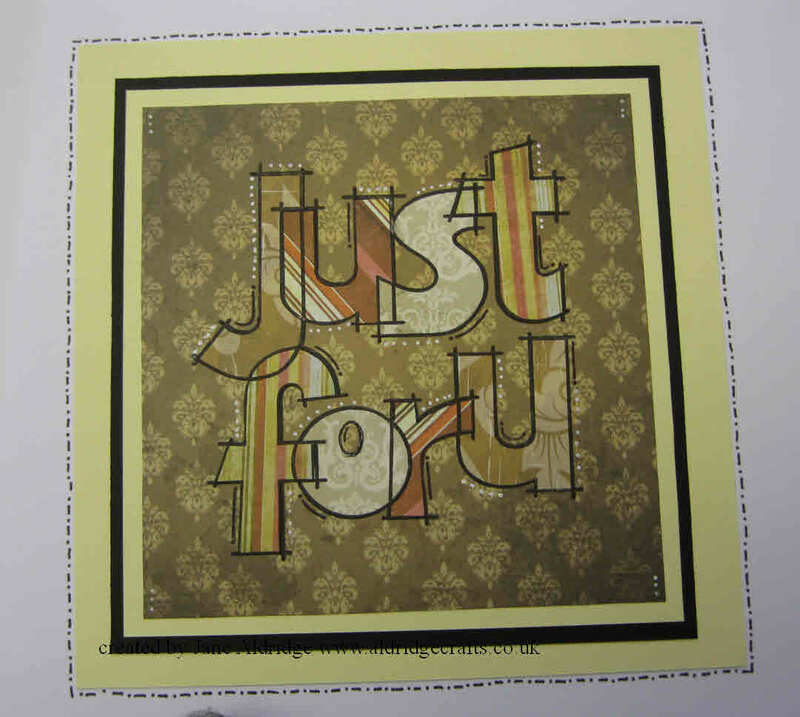 Today’s stamp is the versatile Woodware Just For U (FRS239) stamp. 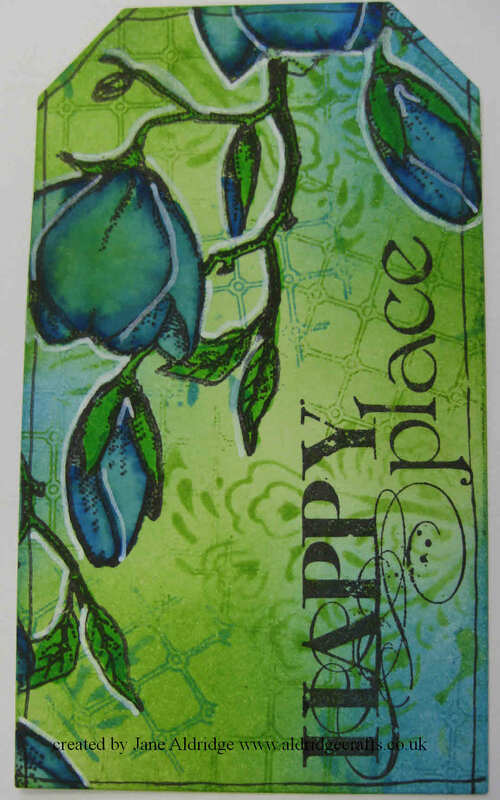 Their large word range is perfect for this technique and there are lots of other designs available. This time I’ve picked a vintage style of paper – and this would make a great birthday card for a man or a father’s day card. This technique is so easy to do. 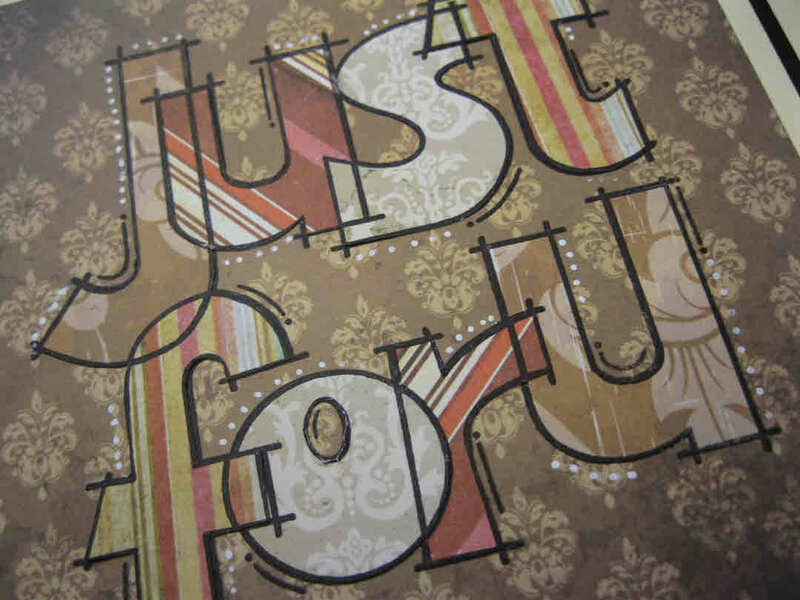 Simply stamp your design onto a backing paper and then stamp each of the letters onto different coloured and patterned papers, cut out and stick over the top. I recommend using the Stix2 Glue Stick – as this gives enough of a strong bond, but when you first stick it down there’s a little bit of sliding room to make sure your piece is perfectly lined up and its less messy than using a PVA which if you apply too much you may make your papers bubble. 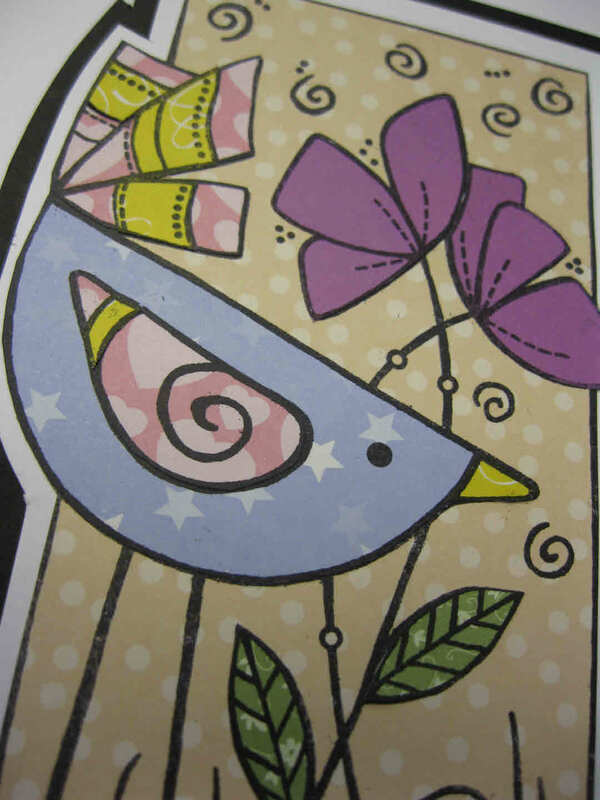 Go raid your stamp stash and see what you can find to use with this technique….. its very satisfying to do! I ran a lovely workshop at the shop featuring Woodware stamps and the paper piecing technique. It’s a technique I haven’t done for ages, but was inspired by all the shares recently by Woodware’s facebook page and we had such a lot of fun! It’s a great technique to use up all those little scraps of pretty papers we all seem to hoard. 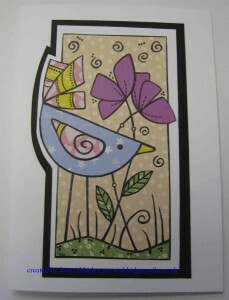 At the same time it breathes new life into stamps you have in your stash too. 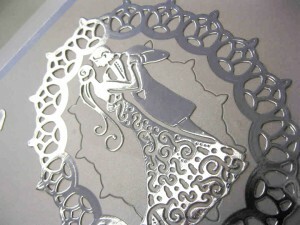 Lots of the woodware stamps are ideal for this technique with their bold clear designs they are easy to cut out. 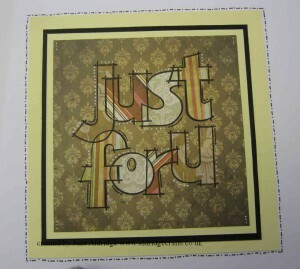 You’ll see a few more samples shared in my next few blog posts with ideas for men’s cards too. This stamp is Special Bird (FRS282) and there is a similar Daisy bird stamp too. We also have lots of 6×6″ paper pads in stock too that are perfect for a co-ordinated design such as this pretty Lavender one. At only £3 each they are fantastic value! 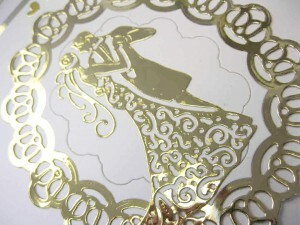 You can see all our paper pads here. 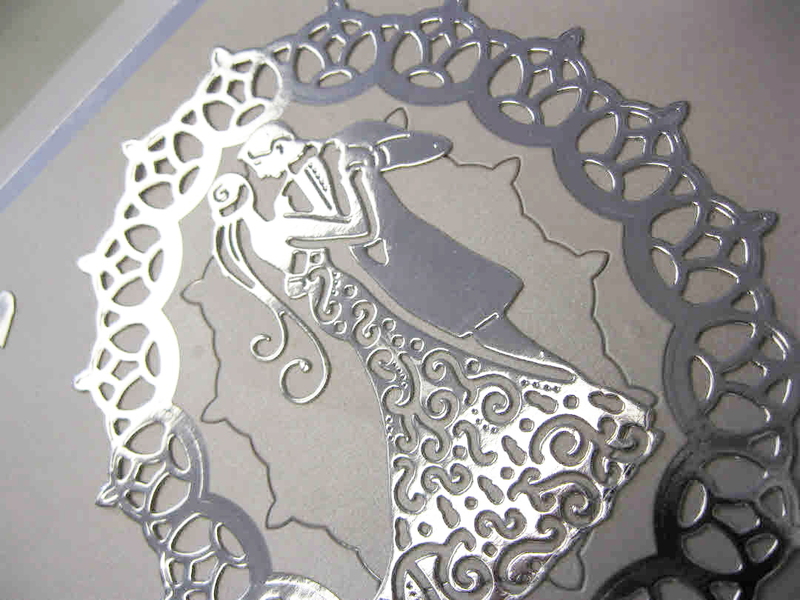 If you are a stamping fan – we have the talented Veronica Pell who is on the Chocolate Baroque Design Team demonstrating in the Attleborough shop on Saturday 18th June 10-3pm. 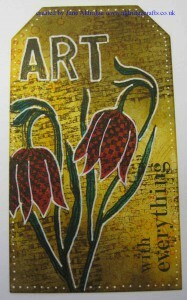 She’ll be giving you lots of inspiration on using Chocolate Baroque stamps.